Middle Jurassic to Early Cretaceous deposits from northeastern China have yielded varied theropod dinosaurs bearing feathers. Filamentous integumentary structures have also been described in ornithischian dinosaurs, but whether these filaments can be regarded as part of the evolutionary lineage toward feathers remains controversial. 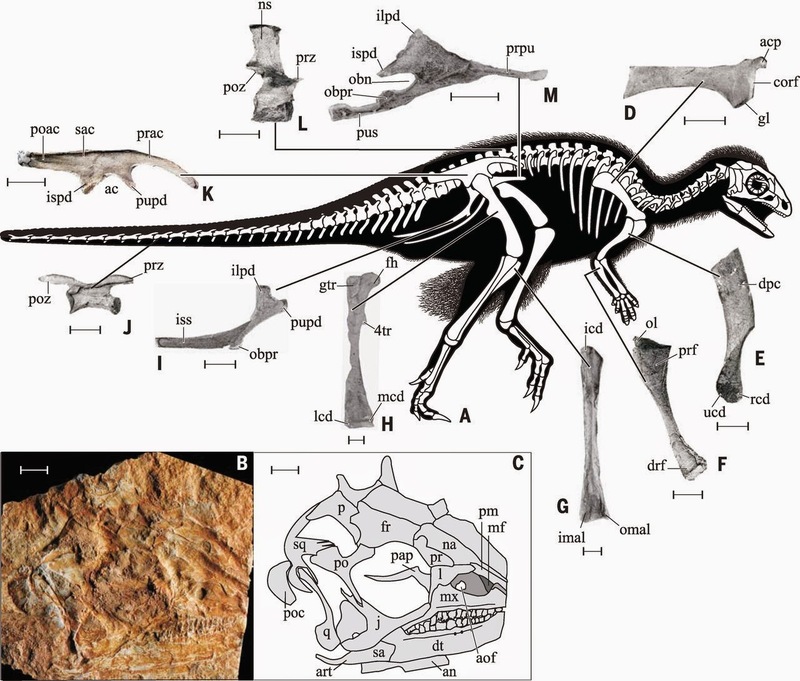 Here we describe a new basal neornithischian dinosaur from the Jurassic of Siberia with small scales around the distal hindlimb, larger imbricated scales around the tail, monofilaments around the head and the thorax, and more complex featherlike structures around the humerus, the femur, and the tibia. The discovery of these branched integumentary structures outside theropods suggests that featherlike structures coexisted with scales and were potentially widespread among the entire dinosaur clade; feathers may thus have been present in the earliest dinosaurs. some great pictures @ Archosaur Musings. Also at Lost Worlds. Pachycephalosaurids Were NOT Upland Fauna? Whither the KMAX Unmanned Helicopter? Memristers Finally Here? HP to Ship in 2016?